So I’m bias because I learnt to drive with Arrow Driving School but they are incredibly good at their profession. They are patient, even with the most nervous of drivers (which I was) and will take you to a point where you are confident and able to pass your driving test. Arrow driving school tailors your driving lessons to you! Everybody is different and they understand that. They also educate people of all levels whether that be a first time driver or a previously experienced driver wanted to boost their skills. They also teach people with disabilities and teach additional courses such as Pass Plus. I really wanted to help push Arrow Driving School find a bigger audience. I knew a website would be key to helping Arrow Driving School do this and help more people with their driving skills. After an initial meeting to we came up with a list of key features the website needed and an understanding of what the website was going to be about. Arrow Driving School needed to be clean, professional and approachable. A key feature would be the ability to get in touch and discuss their services or even book some driving lessons. As well as being able to get in touch we wanted to focus on providing enough information on the services including a description of what they include and the price. I’m incredibly pleased with the solution to this website. I chose an overall contemporary look and feel and splashed some colour in to emphasise certain aspects of the site. The colours chosen were on the subject of driving like green, yellow and red which is the colours of traffic lights. Arrow Driving School has an emphasis on getting in contact with an application form being one of the first things you see when you go to the website’s home page. It also includes customer testimonials so that people reading can see that Arrow Driving School get results! I designed this website from scratch starting with an initial concept and wireframe and moving onto the final designed website. 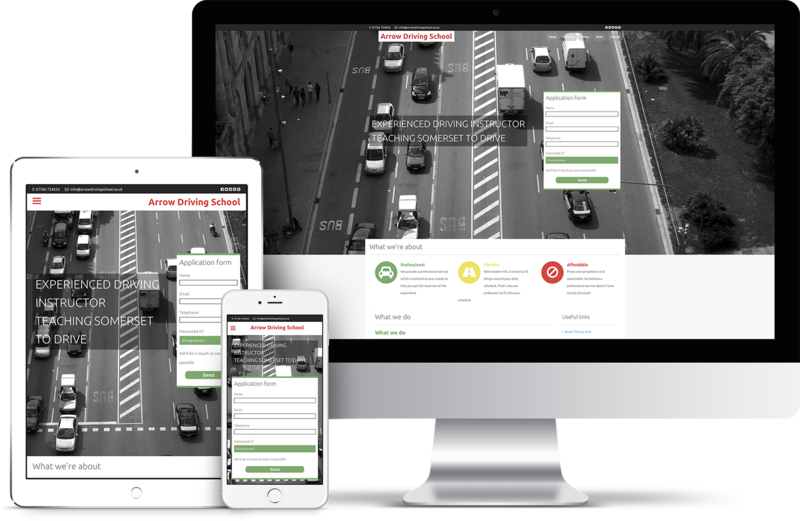 Arrow Driving School is a modern, professional and clean design with emphasis on colours associated with driving to attract users to key information. Using the latest tools and techniques, I set out to create an advanced responsive website suitable for all devices regardless of size or browser. This meets all of the recommended development techniques as well as being mobile friendly and most importantly user friendly. This website was built using LESS css and a custom built framework built by myself. I used WordPress for this project as the basic CMS and built upon it to get the functionality the website required. This website takes advantage of the basic WordPress functionality and adds some additional functionality including the ability to add contact forms, make pricing tables, track site traffic and optimise the website for search engines.